The promise of Home Chef (and other similar meal kit delivery services) is appealing – everything you need to make a home-cooked meal, from scratch, in 30 minutes, delivered right to your door without a visit to the grocery store. As I reflect on the choices that led to the decision to try Home Chef, the phrase “we can do better than this” comes to mind. We throw together meals at the last minute, or end up eating leftovers or takeout. We also waste an incredible amount of food that we buy with good intent and then let expire. We are dependent on frozen and pantry items (think frozen vegetables, canned sauces, prepared fruit cups.) Our menus have become narrow and not as healthy as this dietitian mom wants. Home Chef seemed like a good solution. The recipes were simple, I felt confident cooking them and the food was tasty. For two weeks, I was I able to cook three meals a week after I was done with work. My husband seemed very happy. It made me feel really good to cook dinner. There was just one problem: the packaging of “everyday” and shelf-stable ingredients. As a family of four, they would send two meal kits and I had to double the recipe. It was double the packaging – double everything. They sent EVERY ingredient in exact portions. I would receive two tiny plastic bottles of Sherry Cooking Wine, 8 cloves of garlic and 12 single pats of butter. All the packaging was recyclable, but it was SO much waste. Each meal costs around $9.00, so I found myself calculating how much I just spent on garlic, sherry cooking wine and butter, already found in my pantry and refrigerator. After two weeks, I discerned that the good feelings created by the cooking were not from the service itself, but from the well-orchestrated preparation. 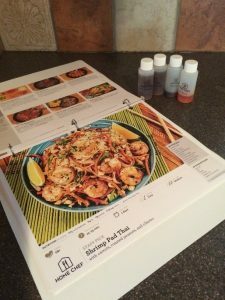 I suspended the service – giving them my feedback – and decided that we would follow the principles of the Home Chef service (good recipes and ingredient prep) and try another attempt at meal planning. That attempt was short-lived and admittedly we are back at square one. While I regret cancelling the Home Chef service, I also have not clicked the “reorder” button, so the choice was probably optimal. My husband gets home from work before me and he is a great cook. I’ve gotten into the habit of just letting him cook dinner nearly every day of the week, though it makes me feel guilty. He, obviously, would like to NOT have to cook every night. But, he dutifully comes home and whips up a dinner that is mostly kid-pleasing starch with frozen veggies and a frozen protein. I do the dishes and we call it a day. He seemed happy with the Home Chef recipes and he was supportive of the whole process. He also supported the decision to stop, because he agreed the packaging was over the top and we could mimic the principles if we tried harder. For the team at Home Chef making decisions on how to produce and package meal kits, we think that to simplify their production they must be producing recipes and kits for a model customer. The archetype they have in mind is a couple with no kids, in a small urban space, who keep very little stock on hand. They don’t cook, or are just learning to cook, and they haven’t built up the pantry that more seasoned cooks might have. Instead of adapting their model to different types of households, they simply use the same meal kits and multiply it times X to accommodate different household sizes. In my work and when I food shop, I also see more and more that food manufacturer and retailers are building up their offerings in the “almost home cooking” space. Pre-cut ingredients. Prepared spice blends. Meal and salad kits with a recipe. These offerings come at a premium price – just as Home Chef is a premium service. It’s an attractive market because the target consumer is working professionals with disposable income, but not disposable time. There are societal norms at play about the role of working supermoms cooking for their families – I certainly feel that pressure. It’s embarrassing that I’m a mom who can’t get it together to cook dinner…made more embarrassing because I’m a dietitian and actually have studied (and taught!) meal preparation and planning. Nonetheless, this RD mom is waving the flag to say it is REALLY hard to have a dual-career family and make dinner work. I think there is a model – maybe it’s out there already and I don’t know about it – where a household could use this style of delivery service and commit to a meal plan where they self-purchase a specific basket of staple items that they will reuse in the plan. Then the delivery service would only send the fresh produce, proteins, and unusual items that can confound meal planning. In any case, there is certainly a market for innovation to make all of this easier, and Home Chef and its competitors are just at the beginning of something really transformational. Maybe this is something I could work on…if I only had the time!